Day 2 – Another Great Day at SHOT! 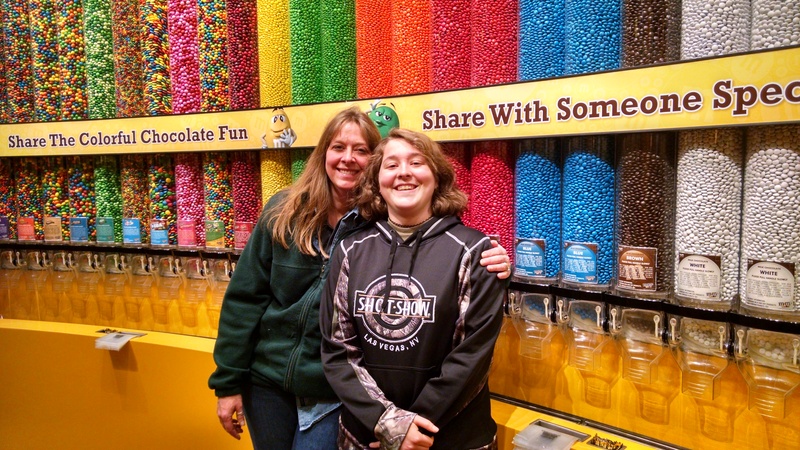 If you have never been to the SHOT Show imagine your favorite outdoor store and multiply it by one hundred. Only then will you begin to realize the scale of the SHOT Show. 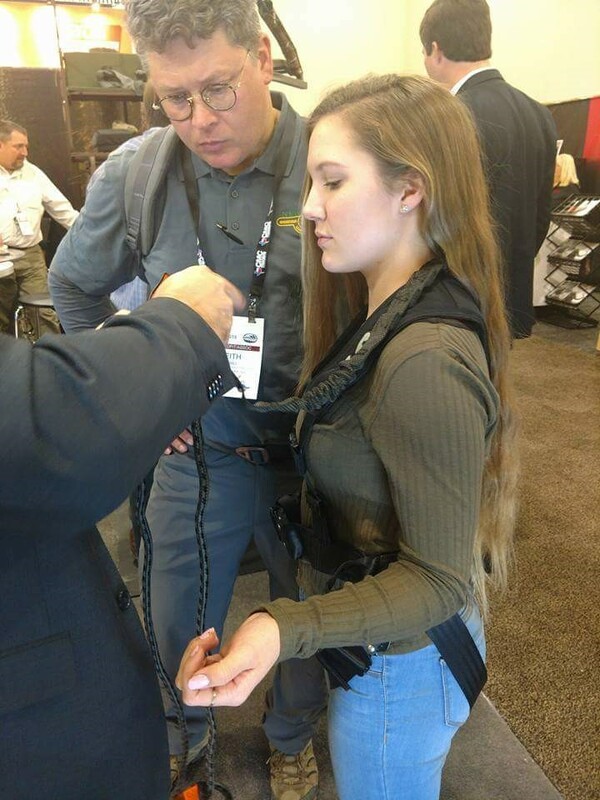 Add to that the vast array of products and companies you may have never seen before, but want to add to your wish list, and that is the SHOT Show! Today, we broke into several groups to cover more booths and make more connections. 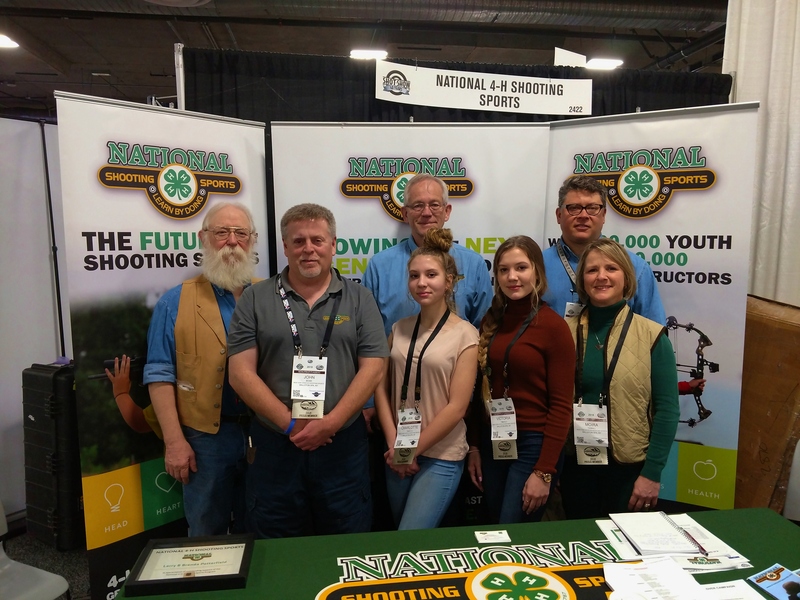 We started the day by dropping by the National 4-H Shooting Sports booth so we could meet members of the National 4-H Shooting Sports Committee. Colleen Kimble and Logan Kimble-Lee were able to meet with Dr. Jeff Goodwin of Colorado State University, Dr. Mark Tassin of Louisiana State University, Dr. Kevin Allen of Oklahoma State University, Nicole Pokorney, of the University of Minnesota, Dr. Todd Kesner of Montana State University, Lisa Muzzey of University of Vermont, John Borba of University of California, and Tycee Prevat of University of Florida. 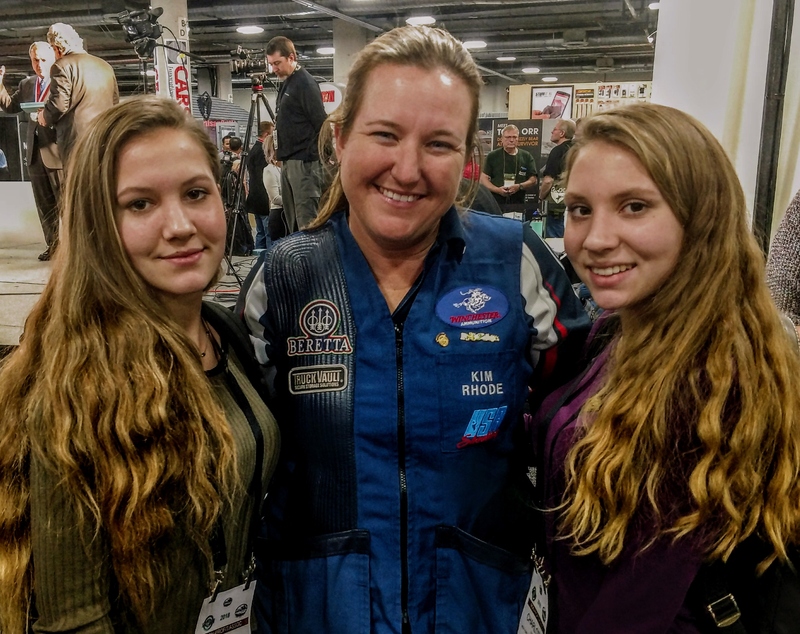 They each were impressed with the bear that Logan harvested with a crossbow in Maine at the age of 15 and with her interest in 4-H Shooting Sports. 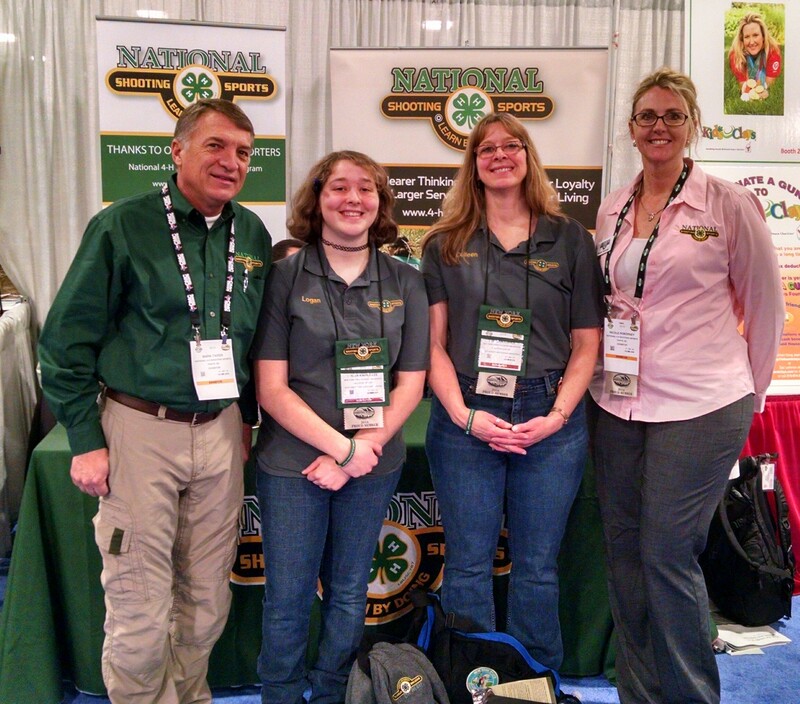 Members of the National 4-H Shooting Sports Committee, Dr. Mark Tassin of Louisiana State University (L) and Nicole Pokorney of the University of Minnesota (R) greet New York State 4-H Shooting Sports Teen Ambassador Logan Kimble-Lee (CL) and New York State 4-H Shooting Sports Instructor Colleen Kimble (CR) at the National booth at the 2016 SHOT Show in Las Vegas, NV. From there, Logan was able to speak with and take a photo with Eva Shockey, who with her father, Jim Shockey, were named Honorary Chairs of the National Fishing and Hunting Day 2016, which is scheduled for September 24th. Eva, an avid bear hunter herself, spent several minutes listening to Logan recount her hunt in Maine and was surprised to hear that Logan had harvested her first bear at the age of 15. Kenyon and Bill spoke with Smith’s, a company that produces a variety of sharpening products, including those which were distributed at last year’s Sportsman Education Workshop in January at the Saratoga County office of Cornell Cooperative Extension. They then met with Birchwood Casey and will be working with Sandy Ellerston. Birchwood has repeatedly provided a nice packet of varying targets that can be used in either 4-H Rifle/Pistol programs or in Hunting/Wildlife disciplines. 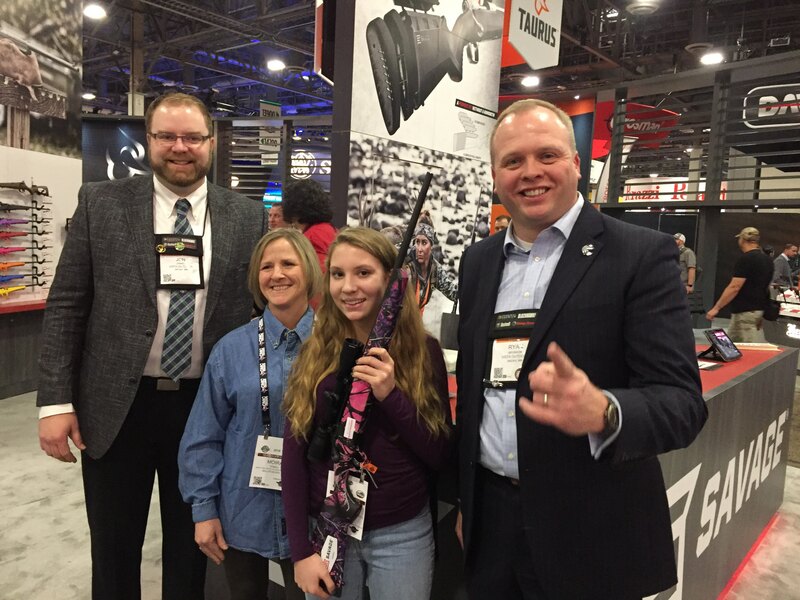 As Logan, Colleen, and I continued around the many displays, we met with Mark DeBoard and Andy Fulton of Crosman about a new bow called Wildhorn that will help bridge the gap between very light weight recurve bows and heavier Genesis compound bows. They come with a very affordable price point that will help our younger 4-H members move into a compound bow when they are ready. Meanwhile, Bill and Kenyon learned about another youth bow from Bear Archery and we will be contacting J.R. Neidlinger about this new option. While they were out looking for new treasures, they spoke with Billy Kasselman of Alexander Enterprises, who makes quality metal detectors. During afternoon breaks, the group meets in the National Shooting Sports Foundation member lounge. There we met up with Robert and Molly Jenks, a husband and wife team who run the 4-H Shooting Sports program in Dutchess County, NY. Their club has grown from a, quickly established, group of 30 to now around 100 youth. The program is also sending 13 new Instructors to the Winter Instructor Workshop in February to handle their growth. Colleen, who like many other outdoorsy people, has a hard time keeping her fingers and toes warm during long stands on the hunting stand or out fishing on a frozen lake. She looked at heated gloves at Glacier Gloves, Brunton, and Flambeau. She also looked at several items that were both useful and beautiful, such as ring necklaces from Mantis Knives, which are both a fashion statement and functional mini-knife/box cutter. She also liked the mini-keepsake box and camelback trunk from Evans Sports, Inc.
Later, we visited with SpyPoint. This company makes a series of different trail cameras and hunting/action video cameras for both fixed mounting and bow/gun mounting. The item that most caught our eye was the Geopad hunting tablet. This nifty little device has a 7″ screen inside a rugged outdoor casing, is GPS, Wi-Fi and Bluetooth enabled with offline maps and game calling abilities as well as an SD card reader that works with all cameras. You might be seeing some of these in New York soon! 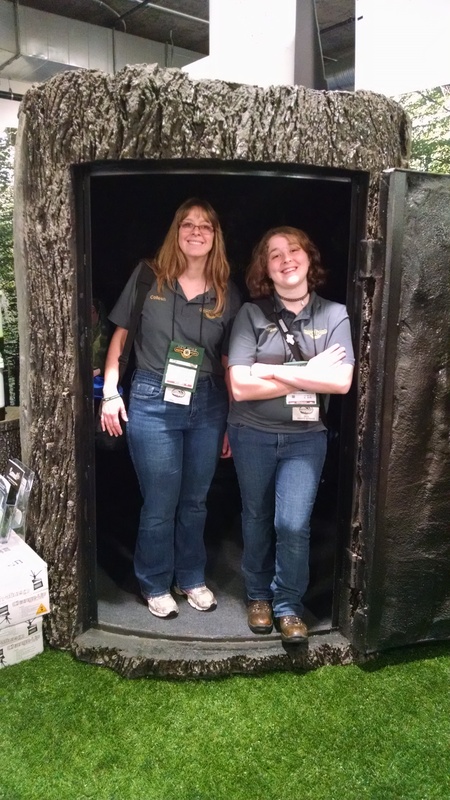 Colleen Kimble and Logan Kimble-Lee, in the Surreal Hunting Blind. This is by no means a comprehensive list as we also spoke with Gene Barnett of Icehole about their new coolers, Surreal Planters that mimic logs and tree stumps using professionally-molded polyurethane, Jeana White at KeyGear of UST Brands, Amanda Dedona at Klecker Knives, and Zubin Outdoors among others on Day 2 of the show. 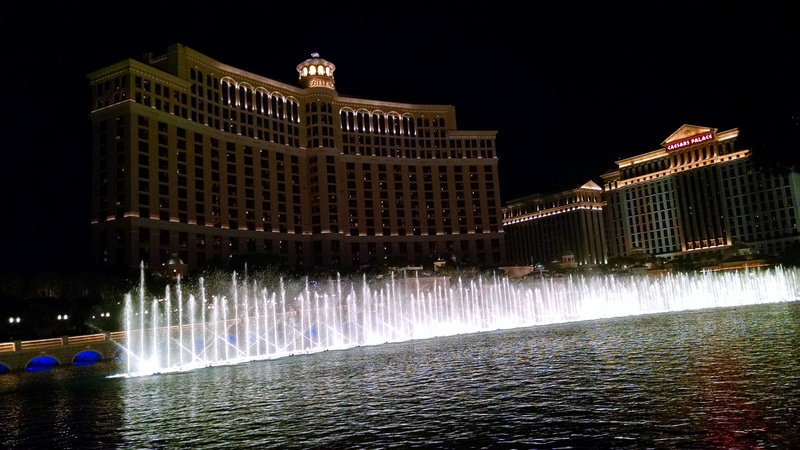 The fountain and light show at the Belagio at night is a beautiful thing. The New York State 4-H Shooting Sports program, represented by Director Bill Schwerd, Assistant Director John Bowe, Education Specialist Kenyon Simpson, State Instructor Colleen Kimble, and Teen Ambassador Logan Kimble-Lee, started their first day of the Shooting, Hunting, and Outdoor Trade Show (or SHOT Show for short), by meeting with Dave Baron, owner of Barron Technology and members of his family and staff. 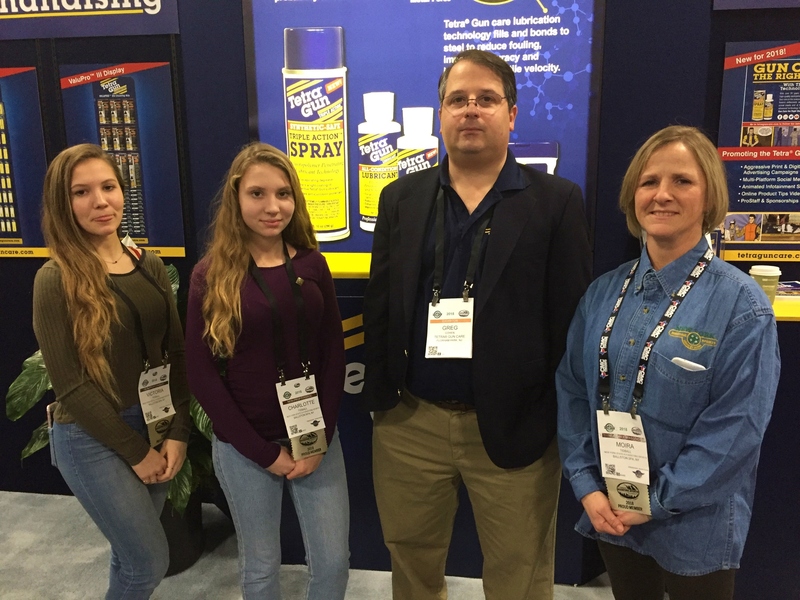 Dave Baron continues to be supporter of 4-H Shooting Sports, both with our New York State program and with National program. He is also involved in National Wild Turkey Foundation work and with the Boy Scouts. Dave’s daughter, Emily, was at the Baron Technology booth and explained to Kenyon and John that she has been looking at a series of colleges that include University of North Carolina – Greensboro, University of Utah, and Rutgers University. Our group, of course, encouraged her to consider Rutgers, a land grant university that is affiliated with Cooperative Extension. Emily also stated that she would soon be getting her pistol permit and showed them several of the intricately engraved pistols that Barron Technology engravers had produced – many of them with gold inlay, custom stocks, and grips. Emily’s favorite, however, was a smaller, less dramatic revolver that had much more subtle engraving with no inlay that was still an exceptional piece of work. John Anthon, President of Great American Tool Company (GATCO) took time out of his busy schedule to greet and speak with Logan. John has done this each time we bring youth to his booth. He is very interested in encouraging the next generation to not only be responsible members of the shooting and hunting lifestyle, but to also consider working in his industry. After a fairly lengthy discussion of Logan’s bear hunting with a crossbow, John presented all the members of the group with a Timberline Knife and Tool #6520 Simba GHS made with D-2 steel folding blade. What a great friend John has been to our program and example of generous leadership to our youth representatives. Colleen, Logan, and John also spoke with Jackie Allen, Project Manager for Barnett Crossbows, explaining that with the recent approval of crossbows as a legal hunting implement in New York, they were seeking a set of bows that had appropriate draw weight for various sizes of youth and also featured finger guards along both edges of the rail. When they mentioned that they had been using some Barnett Phantom Jr’s Jackie joked that she might be the only one in the company that remembered those. Jackie is excited to be working with 4-H Shooting Sports and has worked out a non-profit youth purchase plan. NYS4-HSS will be contacting her after the show to about these models which previewed at last year’s show. Bill met with long-time NYS4-HSS friend and supporter, Wallie Gardner, of Canal Street Cutlery. This collaborative company is now selling a line of knives under the trademark Dexter Knives. Wally showed us a beautiful new knife that has the handle of tactical folder while the blade is a more traditional outdoor blade type. If you are not familiar with Canal Street, they have produced our Limited Edition New York State 4-H Shooting Sports Knife of the Year series, with our logo engraved onto the blades. These knives are usually produced in a limited lot of 25-50. We’re hoping this new knife they showed us today will be the next in that line. 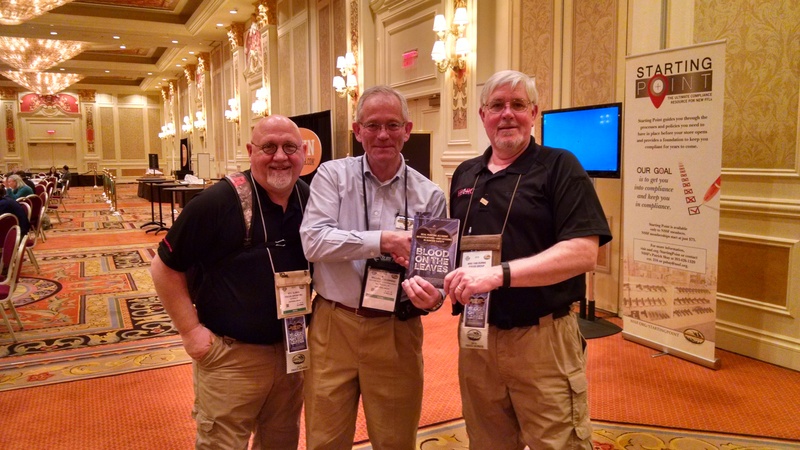 New York State 4-H Shooting Sports Director, Bill Schwerd (C), received a copy of Blood on the Leaves:Real Hunting Accident Investigations and Lessons in Hunter Safety, from two of the books authors, Rod Slings (L) and Mike Van Durme (R). On the return trip to the hotel, while our reps were sitting in the back of the charter shuttle discussing Blood on the Leaves and forensic science in terms of hunter education, came a question from a seat in the front asking if they worked in forensics. The inquiry came from Matthew Kurimsky, a part-time faculty member of Syracuse University’s Forensic and National Security Sciences. Matthew and his wife are natives of Queensbury, NY and the group had a great discussion about forensic science in the investigation of hunting accidents and of shooting cases. Matthew may be willing to do a short session on forensic science at the 2016 STARR program in April. What a small world after all! 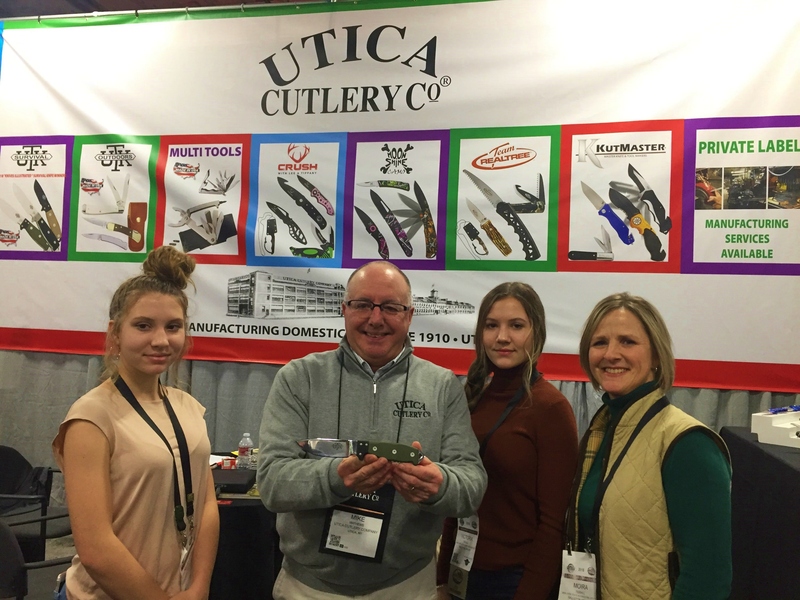 Our NYS crew also met with Joe Simmentelli of Adventure Medical, Stephanie Young of Buck Knives, the staff at American Furniture Classics, Ka-Bar, and CamelBak. 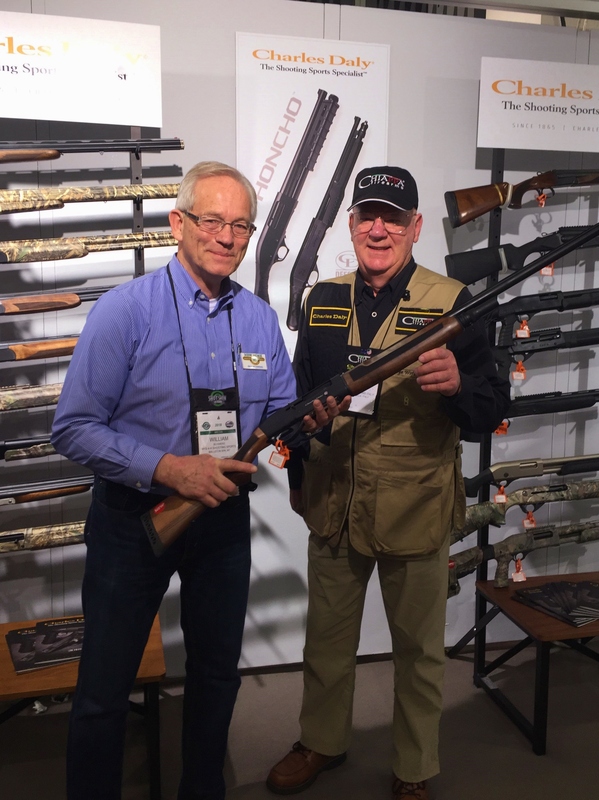 Other companies and organizations visited included Crosman, where they were showing off the new Benjamin Pioneer Airbow, the National Wild Turkey Federation as well as many others. There will be more information about additional contacts in our forthcoming Day 2 blog article. 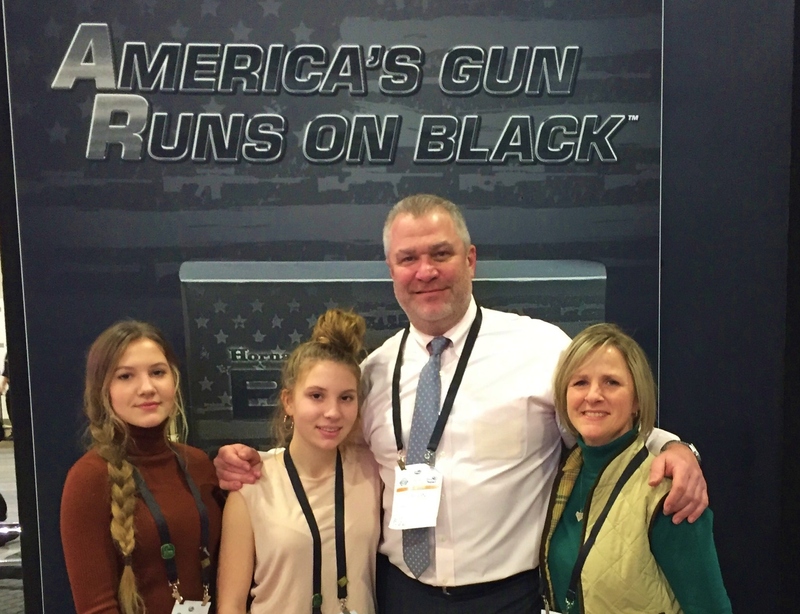 Stay tuned our Blog for more from NYS4-HSS at the 2016 SHOT Show! 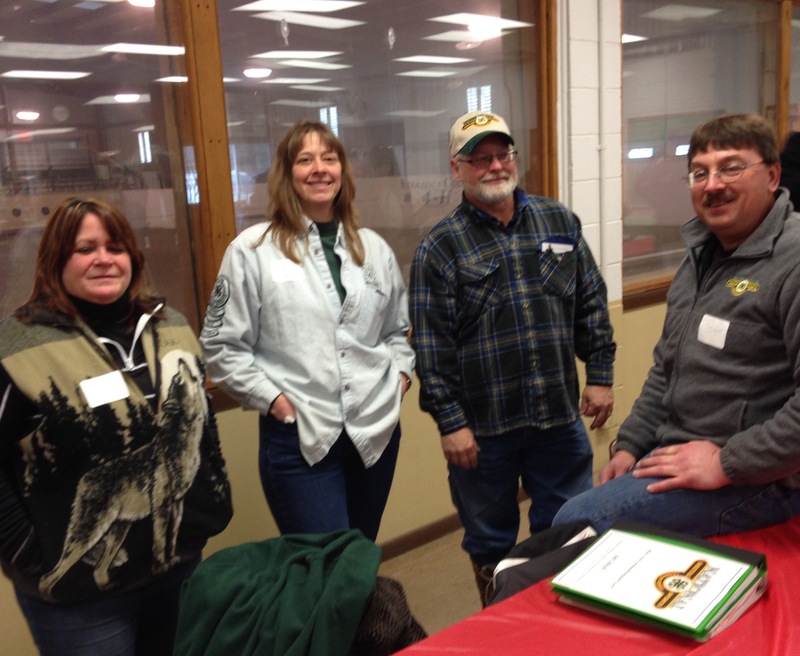 New York State 4-H Shooting Sports Winter Instructor Training, February 20 – 22, 2015, at the 4-H Training & Education Center, Ballston Spa, NY. The 110 plus participants, at the Winter 4-H Shooting Sports Instructor Training, braved the unusually cold weather for their second day of training on Saturday, February 21. The day’s classes worked on First Shot Fundamentals. In First Shot, each discipline is expected to cover the basic safety facets of that discipline in 30-60 minutes. Range set up, bow or firearm safety of a specific make and model, range commands, and progressing through to the actual first shots of the class are covered. The reason for the 30-60 minute guideline is that 4-H is a learn by doing program. 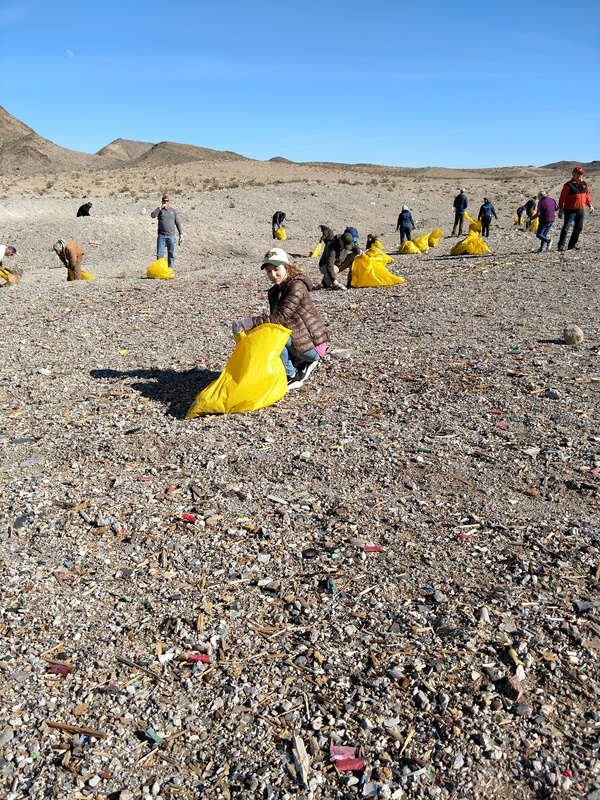 Training includes a combination of lectures, visual aids, and experiential learning integrated into classes to assure the program reaches the most common learning styles. However, there is nothing better than bringing these different teaching tools together in a hands-on activity. Food was plentiful. For breakfast, our cooks prepared over 25 dozen eggs fresh from the Thomas Poultry Farm, in addition to a variety of other great morning foods. At lunch, there were trays of cold-cuts and cheeses as well as cold salads for sandwiches, pasta salad, salad bar fixings, fruit, jello, fresh baked goods and an assortment of homemade soups. We hear the clam chowder was excellent! The dinner buffet included linguine and clam sauce, lasagna, sausage, peppers and onions, vegetables and rolls. There was also a cheesecake taste testing for a local start-up company which was to die for! 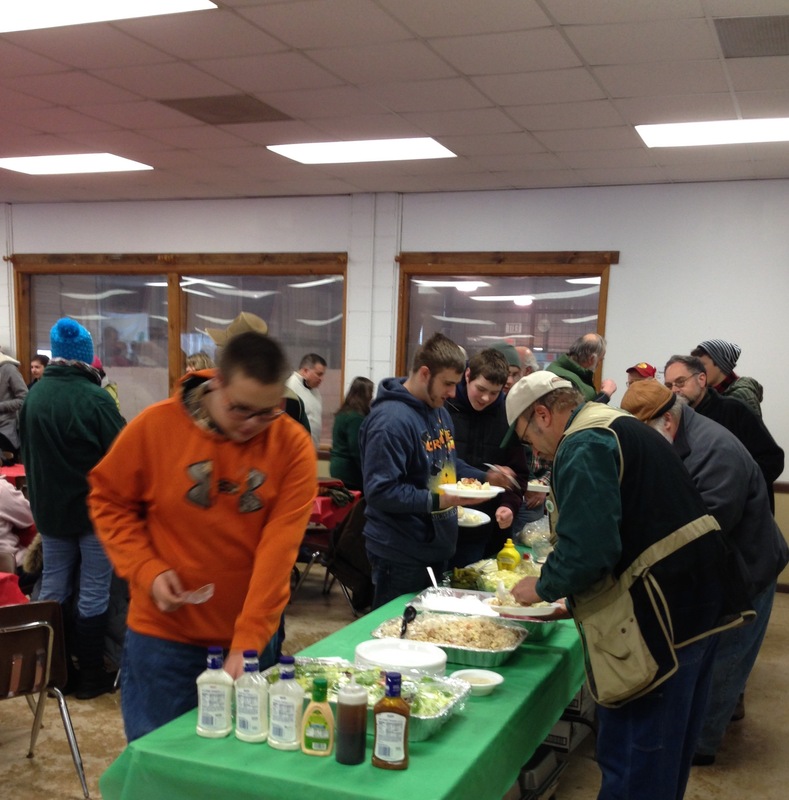 The snow started up around 1:30 PM with Muzzleloading, Shotgun, and Rifle disciplines being conducted partially outside. Meanwhile Air Pistol was using the Crosman Portable Range System to operate their class over in the CCE Saratoga office auditorium. Coordinators discussed the finer points of risk management, county plans and also answered county or student specific questions. There was also a general presentation about the development of a trebuchet (catapult) by Sullivan County 4-H Shooting Sports. This eight foot machine uses a 425 counter weight to toss pumpkins as far as 100 yards! 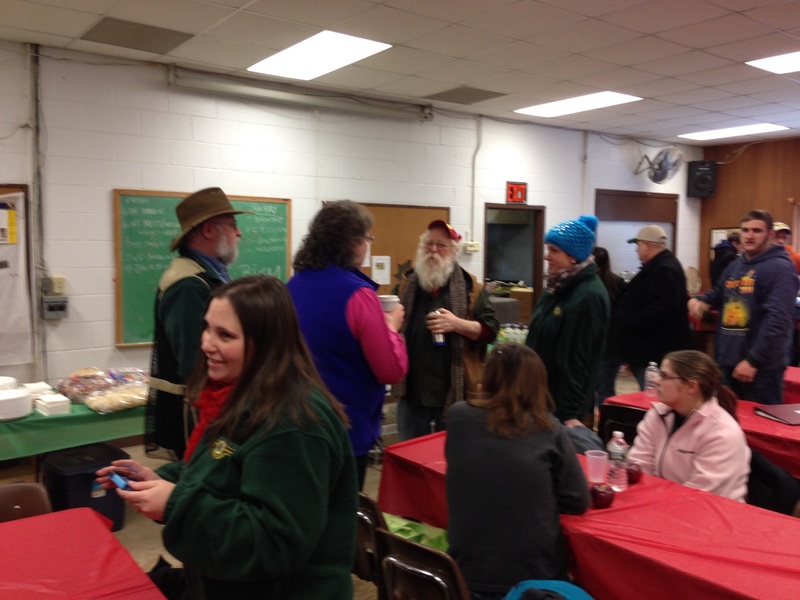 As the snow continued into the evening, the day’s program was topped off by another successful auction that featured maple syrup, art, bow and arrows, several different types of hunting knives, ammunition, hunting and shooting supplies. 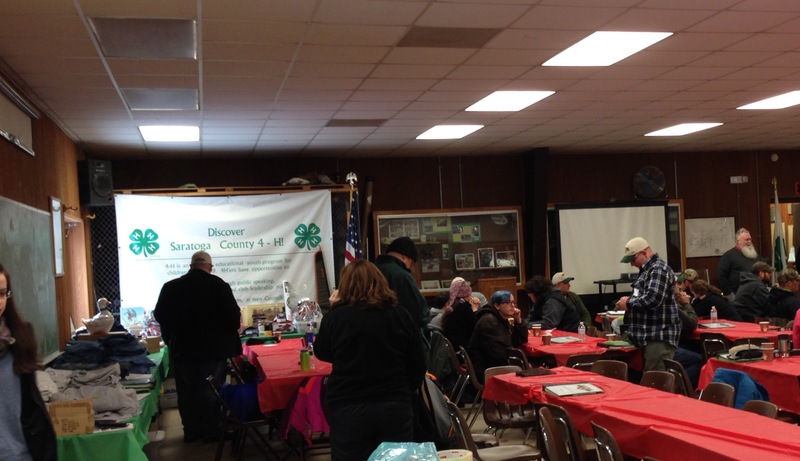 This auction grossed over $2300 for the NYS 4-H Shooting Sports Program with the dollars raised going directly to help support the cost of housing our Instructors for this weekend event, so they can sleep warm and comfortable. This generous support is very much appreciated by both NYS4-HSS and by our attendees who used to have to bunk on the floor in the potting shed or natural resources room. Check back tomorrow for some Cross Training action! 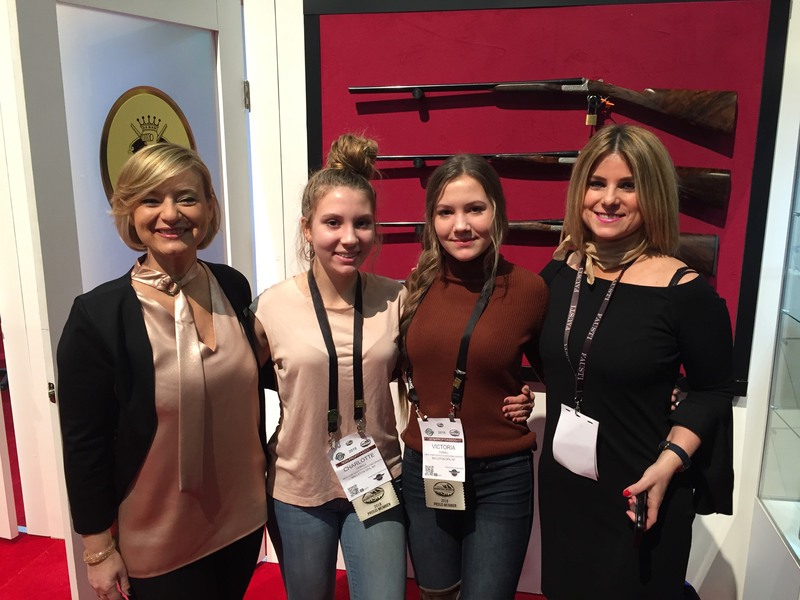 The SHOT Show kicked off in Las Vegas, Nevada on January 20th with two different faces representing New York State 4-H Shooting Sports for 2015. Dr. Keith Tidball of Cornell University’s Department of Natural Resources is attending the event for the first time and describes the show as “Keith’s Heaven.” Joining Keith is NYS4-HSS Assistant Director, John Bowe, who started opening day as the newest member of the National 4-H Shooting Sports Committee as Northeast Representative and then quickly on to his duties representing New York State at the Show. 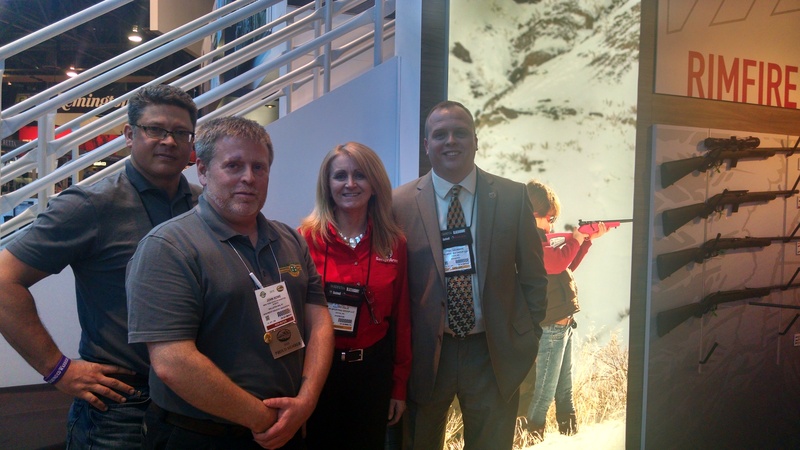 The first day of the SHOT Show was a great success for NYS4-HSS with Keith and John spending quality time speaking with many long-term partners including Ryan Bronson from Federal Ammunition and Cathy Hale from Savage Arms – both companies are under the parent company ATK. 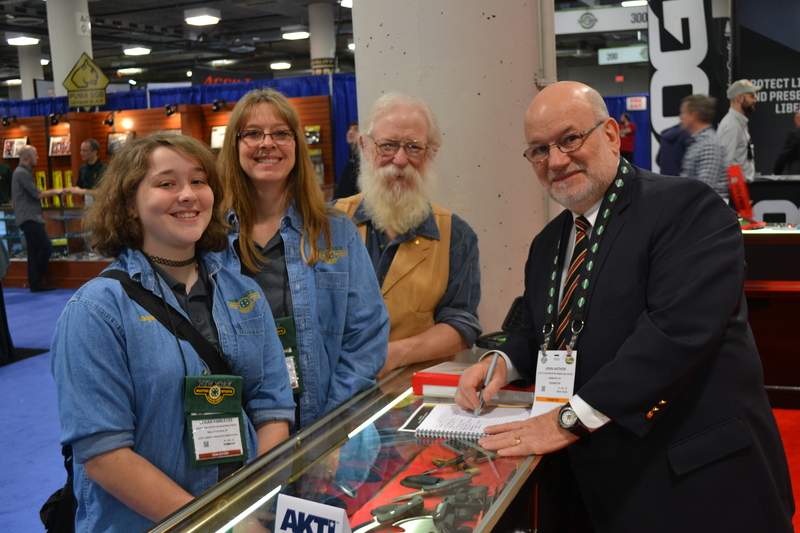 Wally Gardiner, President, Canal Street Cutlery, was proudly wearing his NYS 4-H Shooting Sports pin at his booth and showed Keith and John an exceptional new fixed blade knife they are just releasing. John and Sherry Anthon welcomed our Reps at the GATCO/Timberline booth and shared the exciting news that they now have a Gas Monkey Garage line of knives and a new multi-task sharpener/fire starter. 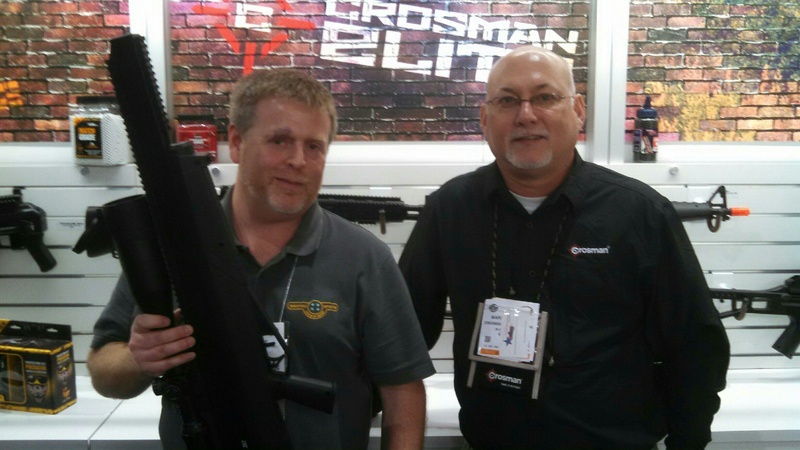 Our Reps also met up with Crosman Corporation’s Shooting Services Manager, Mark DeBoard, who showed them the highly impressive new Bulldog .357 pneumatic high-caliber air gun, powerful enough to take both white-tail deer and feral hogs. 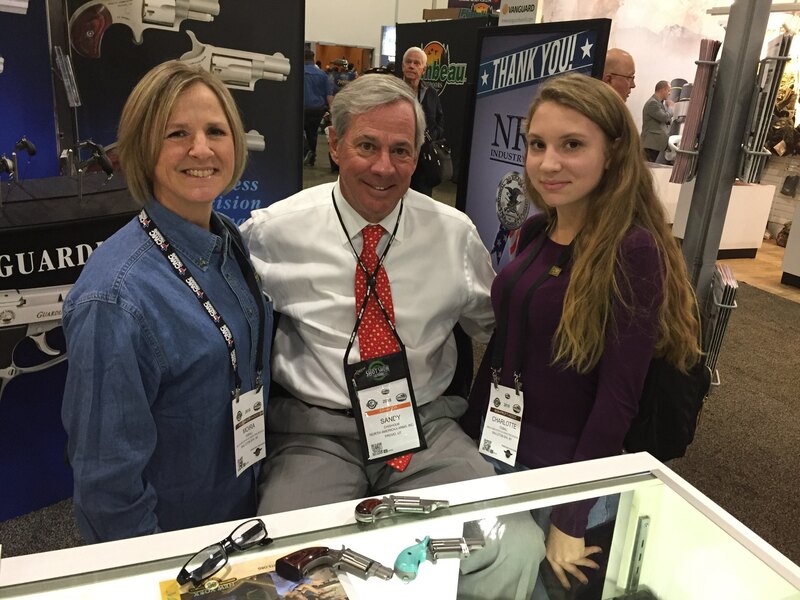 Over at the North American Arms booth, President, Sandy Chisholm was both eager and very pleased to hear what 4-H is doing to educate youth about firearms safety. 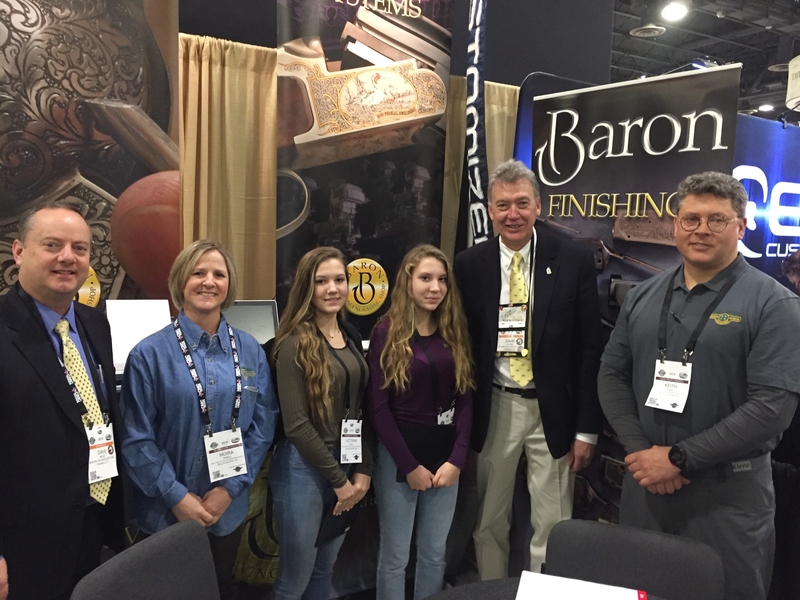 At the Baron Technology booth, the Baron family and staff spoke with Keith and John about their dedicated support to the NYS 4-H Shooting Sports Program. For 2015, Baron Technology will once again be custom engraving a special Limited Edition Firearm especially for NYS4-HSS. 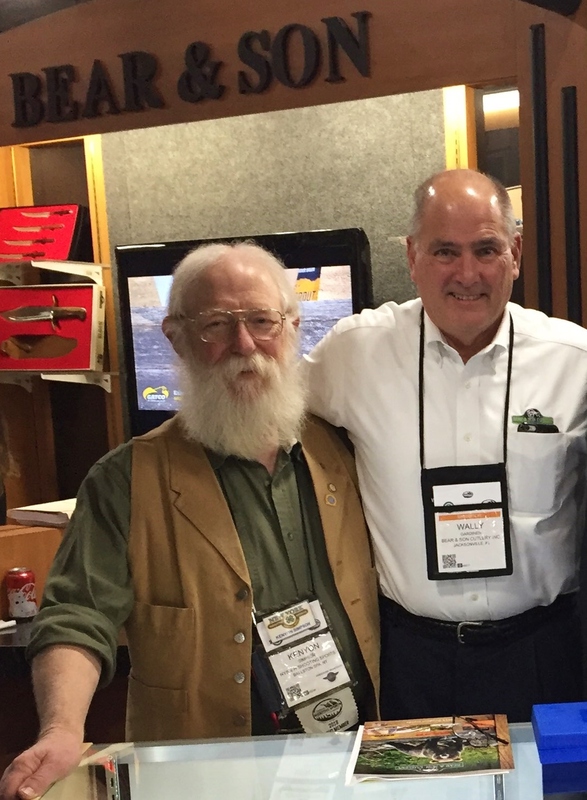 The folks at Columbia River Knife & Tool showed several great new knife offerings and our Reps also enjoyed meeting with knife designer Pat Crawford from Crawford Knives. In another meeting at the J.P. Sauer & Sohn booth, Keith and John discussed potential options the company may be able to offer the NYS4-HSS program. 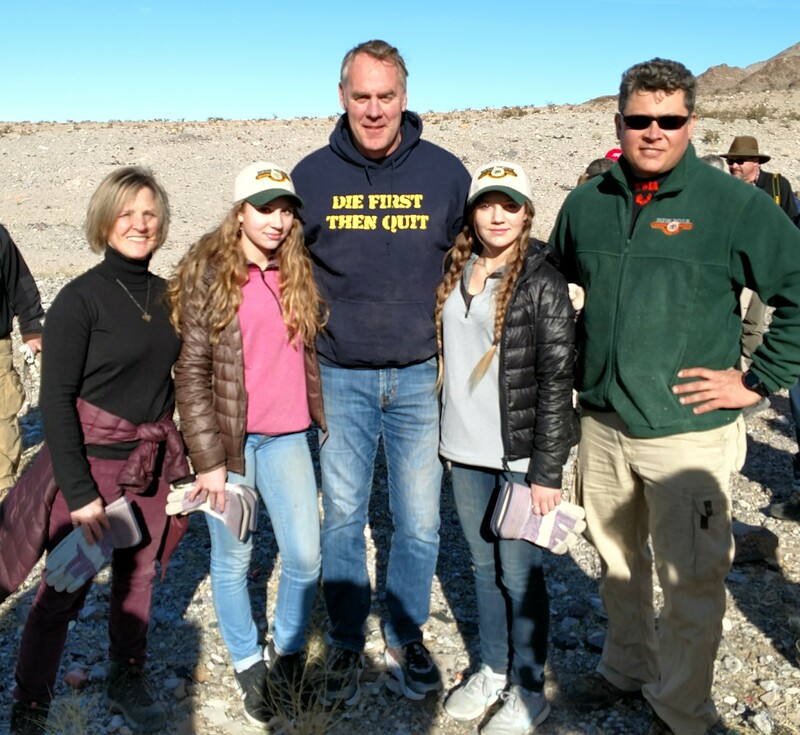 Keith and John also connected with our colleagues from the National 4-H Shooting Sports program, the National Wild Turkey Federation, the National Muzzeloading Rifle Association, Project Childsafe, and the International Hunter Education Association. After a long and busy day covering over 6 miles of the SHOT Show floor, and as part of their cultural education, Keith and John partook of traditional Japanese cuisine for dinner – Sashimi and Nagari. 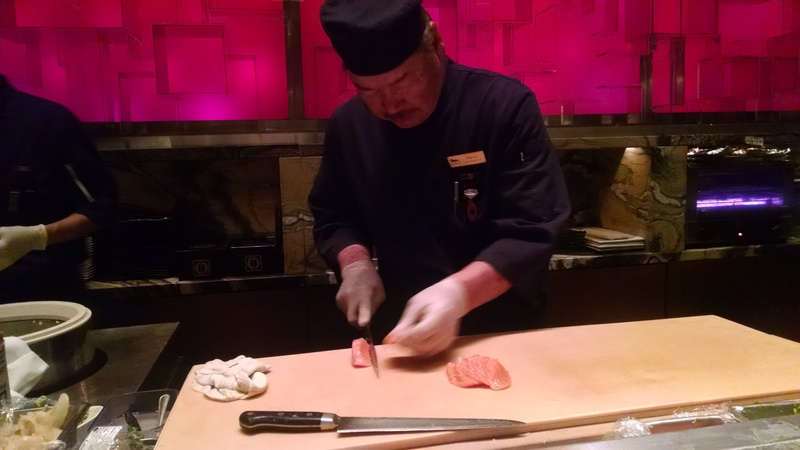 It was John’s first experience with Japanese cuisine and he said it was … Delicious! 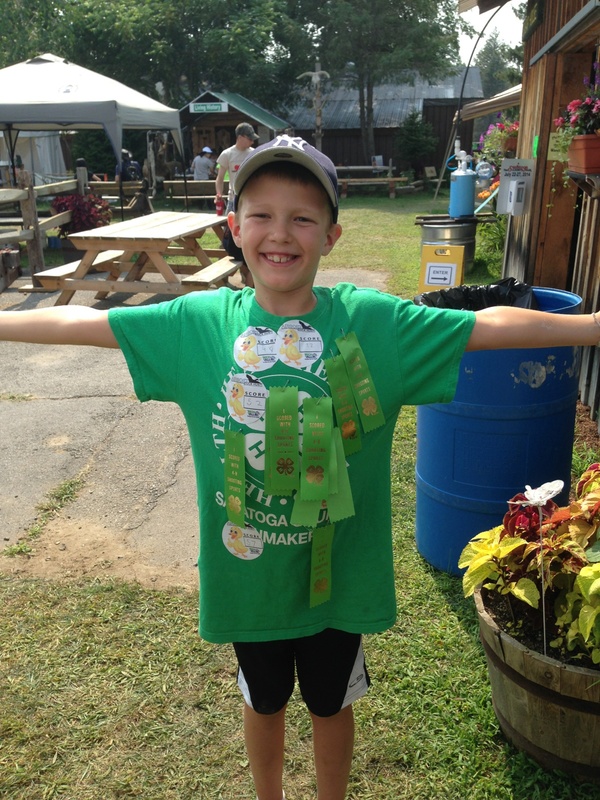 Tech Valley Technologies is Helping 4-H Shooting Sports Stay on Target! 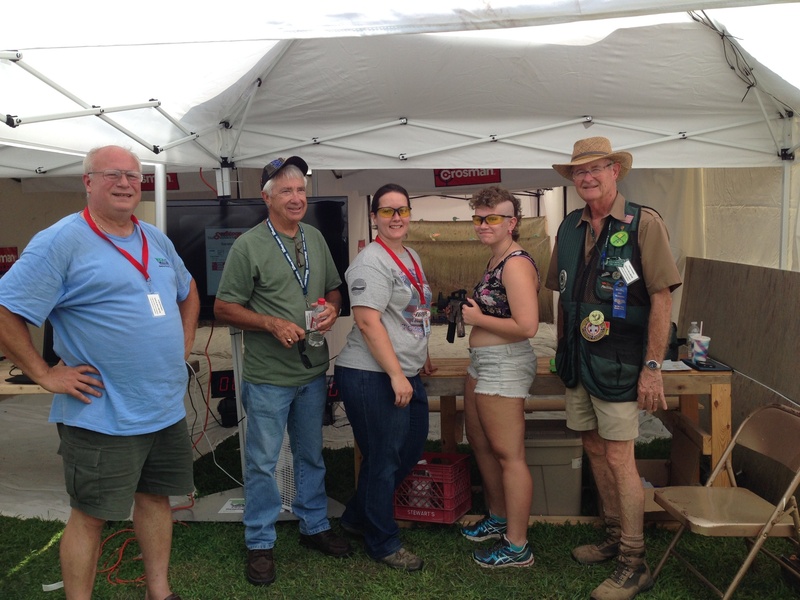 Tech Valley Technologies of Wilton, NY has generously supplied 4-H Shooting Sports with an AirSoft Portable Range for their use throughout the Saratoga County Fair week. The Range, complete with moving decoy Quakers and Crosman AirSoft guns, is located at the back end of Conservation Village just past the Maple Syrup House. All proceeds benefit 4-H Shooting Sports – stop by during the fair and test your best Quaker Shot! (Photographed from left to right) Tech Valley Technologies President Bruce Hodge with 4-H Shooting Sports Volunteer Chuck Corson, 4-H Shooting Sports NASP & Range Development Coordinator Melissa Bailey, 4-H Teen Volunteer Keyra H., and NYS 4-H Shooting Sports Instructor Tony Eastwood, inside the AirSoft Portable Range at the Saratoga County Fair. How much did the kids, adults – everyone who took part in the Tech Valley Tech range – enjoy taking a Quack at it? We think this photo says it all! Thank you Tech Valley Technologies for supporting 4-H Shooting Sports! 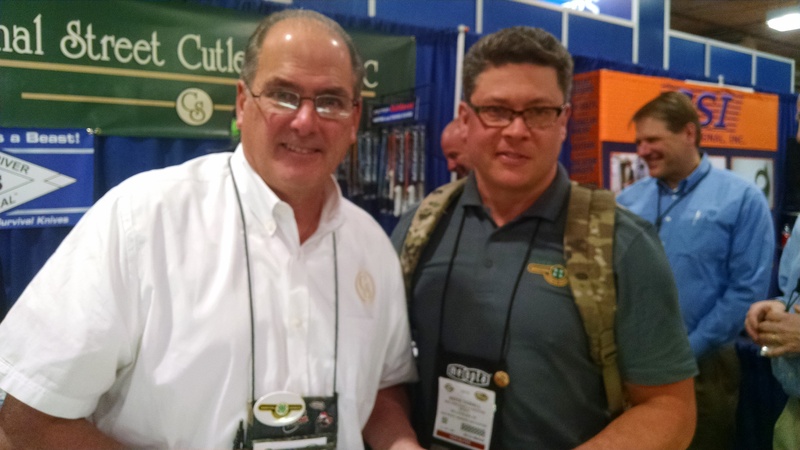 Wally Gardner (L), President, Canal Street Cutlery (Ellenville, NY) with Kenyon Simpson (R), NYS 4-H Shooting Sports, at the 2014 SHOT Show. Chip Hunnicutt (L), Crosman Corporation (Bloomfield, NY) with Bill Schwerd (R), Director of NYS 4-H Shooting Sports, trying out the new Benjamin Break Action Air Rifle at the 2014 SHOT Show’s Media Day at the Range in Boulder City, Nevada.